As we get ready to present our first free, interactive, behind-the-scenes program this Saturday called DCCD Undressed, I have never felt so naked—emotionally, of course. Besides the typical feelings of aimlessness associated with my recent alumnae status, I am also involved in the creation of Josh’s new work titled Aimless Young Man. We are in the studio six days a week working. But, this work feels different from any other of Josh’s creation processes. This one has a very specific story where I am required to play more than just the role of dancer. 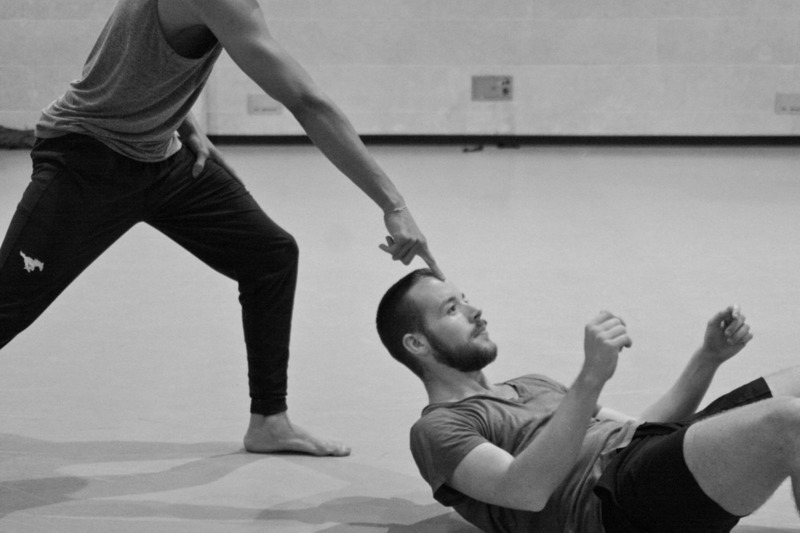 Especially in Josh’s work, sharing a story through dance comes naturally, but when the story is about martyrdom in the 21st century I must dig a little bit deeper. So, from five to ten o'clock, I am not just a dancer but also a researcher, an investigator. On our breaks, and as a group, we excavate information, uncovering images and articles that might help us communicate this story. We work with a heightened level of sensitivity because the material that we collect requires it. We record our emotional reactions to images of torn and battered bodies and try to rely those reactions through movement. Just last rehearsal, we watched a video of a mourning ritual where the mourners repeatedly beat on their chests. As we tried to copy their movement, we questioned: how does this make me feel? How can I communicate this feeling to the audience? And in most instances, the movement material that Josh creates for this piece makes me feel naked, undressed, and vulnerable. And, as I take on this new journey in my life post-graduation, I remain open to these vulnerable experiences. I look forward to the Undressed performance where I can wonder around aimlessly some more exposing myself, the creation process, and the world around me but this time, in front of an audience. We’re working on a new creation for our Winter Series, January 29-31. Save the date! “Make this last run-through all about listening.” On a Monday night after three hours of rehearsal, listening while trying to turn, slide, and balance seemed impossible. We are currently in the process of learning “Words in Motion” by choreographer Chadi El-Khoury, and I am learning how to listen. Yes, the dance itself is very physically demanding. Yoga-like in approach, the piece requires challenging headstands, body-knotting contortion, and one-legged balances. And in the first few days of rehearsal, this movement material felt foreign to us all. We readily shared dumbfounded looks as we watched master Chadi mount into single shoulder stands that seemed to levitate. After the shock subsided, a light laughter almost always followed because we knew that somehow someway, we had to learn just how to execute that exact move. Needless to say, my arms have never felt so sore! But now after about a week with Chadi, I am learning that the dance is not about the body and its soreness, but rather about the mind. Like swimming in thick ooze, the group slowly floats into movement with the goal of synchronizing so that each stroke is in perfect unison. And more so than the dance’s demanding physicality, it is a mental test, challenging our eyes and ears to remain sensitive and aware to the group’s space and timing during the twelve-minute piece. Chadi reminds us to listen. At first it sounded simple, but I soon learned that listening, much like mastering a headstand, takes time. Fortunately, working with Chadi has made this listening test a little easier. He teaches by example: having patience in the process by giving us the time we need to really understand the movement but more importantly, to understand and listen to each other. So in our last run on Monday night, I ignored the soreness in my arms, put my meticulous attention to detail aside, and instead focused on listening to the group. And the things I heard as a result reminded me why I love to dance. In working with Chadi, my ears are growing. I am starting to listen to my fellow dancers—waiting or speeding up so that we all meet and meditate together. And as we finish up “Words in Motion,” I am eager to keep practicing how to listen to the words my peers say—even if these words are not spoken but instead danced. Join us for an in-studio sneak-peek at our 2014/15 Season SUNDAY, MAY 4 @ 3PM at Preston Center Dance. Give what you can and enjoy! 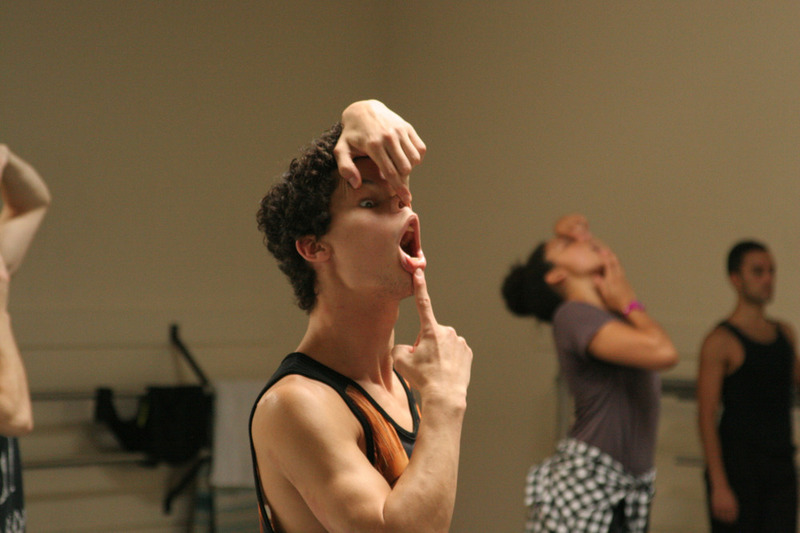 The past week has been both an exciting and intense one for Dark Circles Contemporary Dance. We are just over two weeks away from the premiere of White Day at the Hardy and Betty Sanders Theatre in Ft. Worth, and since Tuesday, we have been working with guest choreographer Louis Acquisto on his new work, Nemesis Variations. Though currently based in San Francisco, Louis is a St. Louis native and Southern Methodist University alum ’09. I met him for the first time at our first rehearsal last week, but already it feels as if I’ve known Louis much longer. Perhaps that feeling stems from the fact that we both graduated from Division of Dance at SMU - even though our time there did not overlap, the common experiences we encountered during our years as undergrads make me feel like we are a part of the same SMU family. Nemesis Variations is extremely different in both style and concept from Marshmallow and White Day, the other two works that will be performed in the spring program. This has made the past week challenging and even more exciting because we are getting the chance to explore a different style of movement as a company. Although this is my first season with DCCD, I’ve already become accustomed to the dynamics between all of the dancers and Josh as artistic director, choreographer, and fellow dancer – all roles that he typically rotates between multiple times within the course of one rehearsal. This week, the dynamics have shifted as Louis has taken over the role of choreographer, giving Josh more time to observe, manage, and direct. As a choreographer, Louis is fun, energetic, and also demanding. The process has been a constant adventure of learning choreography, work-shopping movement as a group, and even doing some individual choreographic assignments. From the first rehearsal, Louis expressed that the movement should feel good and asked that we share with him when something didn’t feel right so he could change it. I have great respect for the amount of trust he has bestowed on us as dancers by being open to our opinions throughout the creative process. Louis has a very clear vision for this piece, and each section works to reiterate his choreographic statement in a new setting. Dancing the piece requires a transformation – while the concept is unchanging, the characters do change. There is no beginning, middle, and end - rather, the piece is comprised of snapshots from various landscapes that seem to be worlds apart. The structure is fascinating and complex – I feel as though I am an actor in six different plays that, despite the different scripts, costumes, and character names, all have the same ending. This structure speaks to the universality of Louis’s message, which I think will come across very clearly in the performance. While Louis shared with us the background of the piece during the second rehearsal, he again has given us a generous amount of freedom, asking that we form our own personal interpretation for the piece. As a 2013 graduate, it is encouraging for me to see how just four years of experience in the real world can foster such an enormous amount of growth and artistic maturity while still calling on the fundamentals acquired through the dance program at SMU. One of the most special things about DCCD is how connected we all are despite the wide range in experience. Each day in rehearsal, I have the privilege of learning from multiple generations of SMU graduates who came before me, current SMU and Booker T. Washington students and alumni, and other Dallas-based dancers. It is exciting to see how each of our experiences have overlapped throughout the years, how we have crossed paths, and how each individual’s path has been shaped by other influences along the way. I see role models in those both older and younger than me. To me, this sense of community and the shared love for movement that has brought us together is what dance is all about.